The contest will consist of the consumption (as quickly as possible) by each contestant of one double-decker MoonPie (NO SUBSTITUTIONS) and one RC Cola (or a carbonated cola product of the contestants choosing). The flavor of the double-decker MoonPie chosen by the contestant is only limited by the offerings available at the time. The contest will start with an unopened double-decker MoonPie and an unopened cola placed on a table in front of each contestant. The on-site MEC coordinator will determine if the contest will be held standing or sitting. 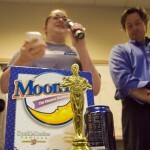 The MoonPie and cola must remain unopened until the start of the contest. The MEC coordinator(s) will employ one or more judges and a timekeeper to assure that the contest is conducted in a fair manner. The contestants can consume the double-decker MoonPie and cola in any order they choose, including both at the same time. The winner will be determined as follows: The first contestant to finish both consuming the entire double-decker MoonPie AND drinking the entire cola will be declared the winner. The contestant will indicate that the cola has been completely consumed by turning the cola can upside down and placing it on the table. The MEC judge(s) will determine if the MoonPie has been completely consumed. The timekeeper will report and note the time that the first contestant finishes to determine if it is a new MEC record. The winner of the MEC will be given the opportunity to make a public statement. The loser(s) will be expected to clean up the mess. In case of a tie, the on-site MEC coordinator has the option of implementing the sudden-death rule, which is the timed consumption of a second double-decker MoonPie with no drink involved. Any variances granted to these rules are at the discretion of the on-site MEC coordinator and must be made known to (and agreed to by) all participants. Variations, however will serve to invalidate any time records set and will not be officially recognized by the sanctioning body.